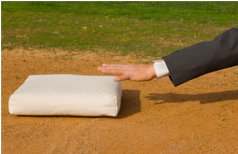 3 Sales Follow-Up Strategies to Replace "Touching Base"
MARTY'S QUESTION: You often mention that it's bad to follow up with prospects by saying, "I'm just touching base." I'm struggling to find a decent alternative. What do you recommend? MY ANSWER: It's more than just finding replacement phrases like ""checking in." When you leave messages like this, your prospect deletes them in a nanosecond. Worse yet, they see you as just another pesky salesperson. Clearly, that's not good! You might say: "Pat, in our previous conversation you mentioned how important it was to get going on this soon so you could realize the savings (eliminate redundancies, drive incremental growth) that you need by year end. Let's set up time to talk so we can get you moving forward." Your prospects want to work with someone who's constantly thinking about how they can improve their business. Be that person. You might say: "Pat, I've been thinking more about how we can help you increase sales (reduce costs, speed up productivity). I thought you might be interested in what we did with XYZ organization when they were dealing with the same challenge. Do you have a few minutes for a quick conversation?" Sometimes your prospects are still asking themselves, "Does it make sense to move forward or not?" From the outside, you won't know. But you can keep giving them more reasons to change! You might say: "Pat, I know it's a big decision to change from the status quo. That's why I thought you might be interested in this article (ROI calculator, case study, webinar, ebook) on (relevant topic). Let's set up a time to talk through your questions." See the difference? You're still providing value. Even though they said they were interested. Even though they told you to check back next week. Even though they told you it was a "slam dunk" and they just needed to get the paperwork done. Drop the "touching base" and "checking in" mentality from your vocabulary entirely. When making follow up calls, become an asset in their decision process. That's when they'll really want to work with you! Question: What are some successful strategies you use when following up with prospects? Enter your comments now.